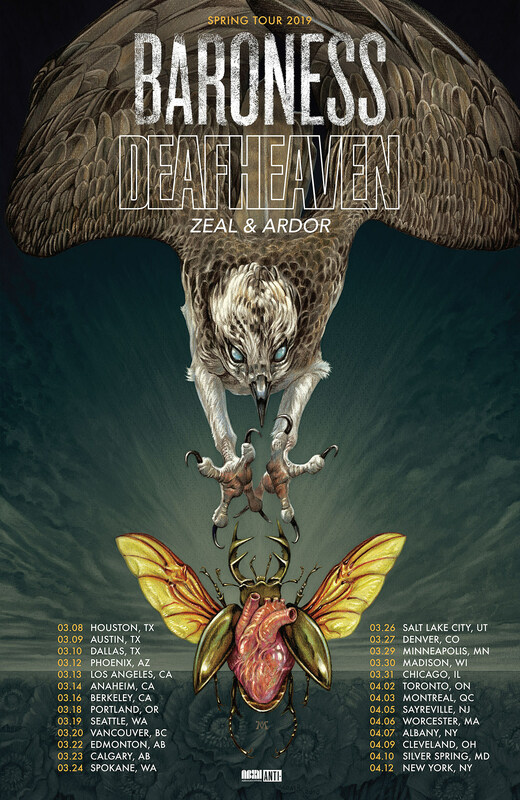 Two of the biggest and best modern crossover metal bands, Baroness and Deafheaven, have announced a co-headlining tour for 2019. Support comes from Zeal & Ardor, who’s on the rise and very worth catching as well. Things kick off in Houston in March, and wrap up with Baroness and Deafheaven’s stop at Decibel Metal & Beer Fest in Philly. In between, they’ve got a NJ show on April 5 at Starland Ballroom and a NYC show on April 12 at Terminal 5. Tickets for all dates go on sale Friday (12/14) at 10 AM local time with presales starting Thursday (12/13) at 10 AM. All dates are listed below. Baroness are working on their fifth album, and hopefully we’ll learn more about that soon. Deafheaven returned this year with Ordinary Corrupt Human Love (which landed on year-end lists from Decibel, Pitchfork, and more, and got them nominated for a Grammy). Zeal & Ardor released Stranger Fruit this year which also landed on Decibel’s list. Watch videos from all three bands below.